To learn more, please just download our free report A Golden Opportunity. In our last post we mentioned the active investment strategy that Bill O’Neil and we use is based on facts. These are facts that have come from the entire 125 year history of the stock market and they are not opinions. That is probably why it tends to work so well. We're immensely proud of the fact that over the last 18 years1, this method has helped us to outperform the FTSE 100 by 99.7% and over the last 3 years2 , we’ve made an average annual return of 9.8% versus the FTSE 100’s 1.9%. We think it is a great way to stay in step with the market. But we have to warn you that it’s not foolproof. Our clients follow in our footsteps and have the opportunity to invest in exactly the same funds we we're investing in. Therefore, if they follow our lead, they have the potential to achieve exactly the same returns as us. 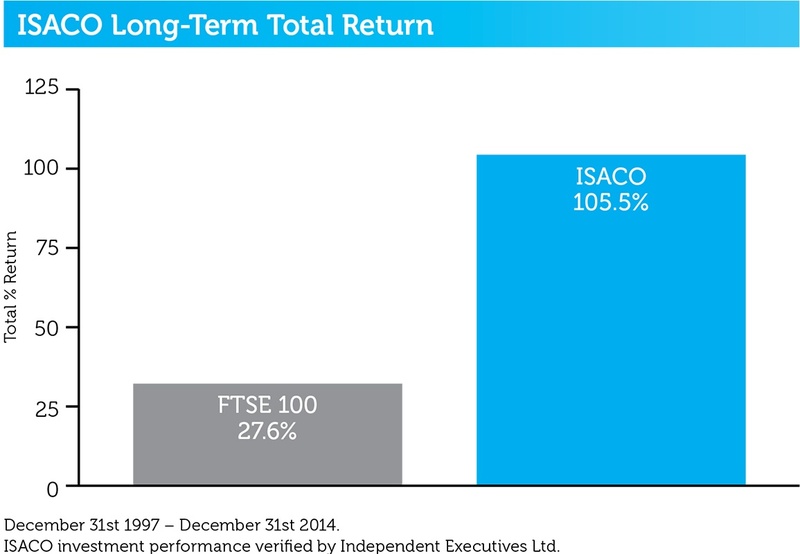 1 December 31st 1997 - December 31st 2015 ISACO 121.0%, FTSE 100 21.3%. 2 December 31st 2012 – December 31st 2015. Clients like the fact that we put our own personal money where our mouth is. It puts them at ease knowing our track record and following what we are doing with our ISAs and SIPPs. We think it gives them peace of mind knowing that we have significantly sized tax-free accounts and that we have been investing in ISAs since 1997. They understand that the decisions we make about when to get into the market, what to get into and when to get out, are not taken lightly. And unlike hedge funds, we don’t take a penny of any of the profits our clients make. This means if you became a client, you get to keep everything you make. Plus we are totally impartial. Unlike financial advisers, stock brokers and banks, we do not receive any commission from the investment funds that we personally invest in. That’s also something our clients see as a benefit. Do you know the following fact? Approximately 75% of the stock market’s movement comes from institutional investors. Yes it’s true, the big professional investors have the largest influence on the market’s future direction. Institutional investors can be fund managers, banks, building societies or insurance companies. If these 800-pound gorilla investors are buying, you can jump on their coattails. Similarly, if they are selling, you can quickly switch out onto the sidelines. Picture the market as a big tree. Let’s imagine the professional investors being woodcutters. If the professionals are selling heavily, then you can see them selling their stocks by looking at charts. When they sell, it’s like they’re taking a cut out of a tree and, of course, this makes the tree, or market, weaker. If they take too many swipes at the tree in a short space of time, what is going to happen? That’s right, the tree will fall over. So when the tree, or market, gets weak because of excessive selling or cutting, it sends you a red flag to say it might be time get out of the market. On the other hand, when the professional investors are buying heavily and in a short period of time, it makes the market healthy and extremely strong – and this is the time we like to be invested. Did you know that the NASDAQ Composite, the US technology index, has averaged 9.13%3since its inception back in 1971? 3 Yahoo! Finance: February 5th 1971 - December 31st 2015. Did you also know that over the last 16 years, as you can see from this chart, it has virtually moved sideways? Let me repeat that once again for emphasis. Over the last 16 years, the NASDAQ has not made any price progress and therefore could be due a move. Could there be a possible stock market boom on the horizon? Even though we’d ideally like to beat the NASDAQ, aiming to outperform it would be an unrealistic goal. Our objective is to outperform a stock market index that I’m sure you are very familiar with, the FTSE 100. Beating the Footsie is a tough objective because most of the professional fund managers who benchmark against it, fail to beat it. However beating the FTSE 100 in our opinion is realistic and doable. The FTSE 100 has annualised 5.9% since its inception 32 years ago4 . That tells us that if we can beat the FTSE 100 over the long term, we’re going to be blessed with a reasonable rate of return. Since beginning investing back in 19975 , we’ve outperformed it by 99.7% which means we’ve beaten the main UK stock index on average by 3.4% per year. 4 January 3rd 1984 - 31st December 2015. 5 December 31st 1997 – December 31st 2015. By doing the maths, if we continued to outperform the FTSE 100 at the same rate we have been, we might achieve a 9.1% return over a 28-year period, which I’m sure you’d agree would be an excellent long-term gain. Remember however that past performance is no guarantee of future performance. In our next post in this series we'll demonstrate the importance of being ‘active’ when it comes to fund selection. To learn more, please just download our free report A Golden Opportunity. ISACO are a specialist in ISA and SIPP investment and together with our clients have an estimated £75 million actively invested6. To help investors like you, we offer a high end service called ‘Shadow Investment’. Put simply, we invest and you invest beside us. As we grow our wealth, you grow yours. We have an active investment strategy which aims to control risk and deliver superior performance. Over the last 18 years7, we’ve beaten the FTSE 100 by 99.7% and over the last 3 years8, we’ve made an average annual return of 9.8% versus the FTSE 100’s 1.9%. 6 Internal estimation taken January 1st 2015 of total ISA and pension assets owned by the ISACO Investment Team and ISACO premium clients. 7 December 31st 1997 - December 31st 2015 ISACO 121.0%, FTSE 100 21.3%. 8 December 31st 2012 – December 31st 2015.